Here are a few more items I've made for Many Hands. 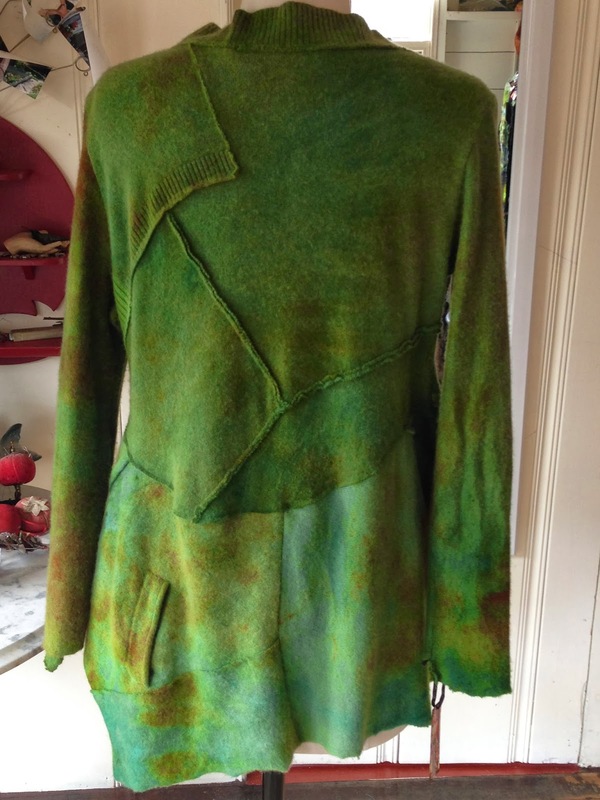 This sweater was made from several over-dyed cashmeres. I still love the drapy look because it's so attractive on so many figures. 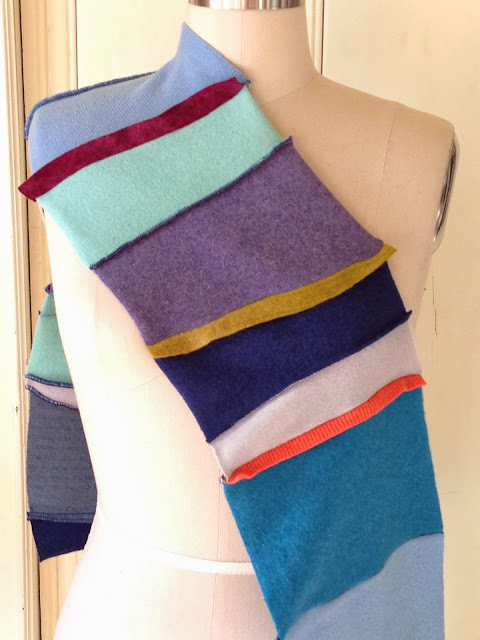 I forgot to take photos of this scarf and sweater while they were in my studio so I took them at Many Hands. Sorry, not great photos but since I started this blog to document what I've made I wanted to get them in here! 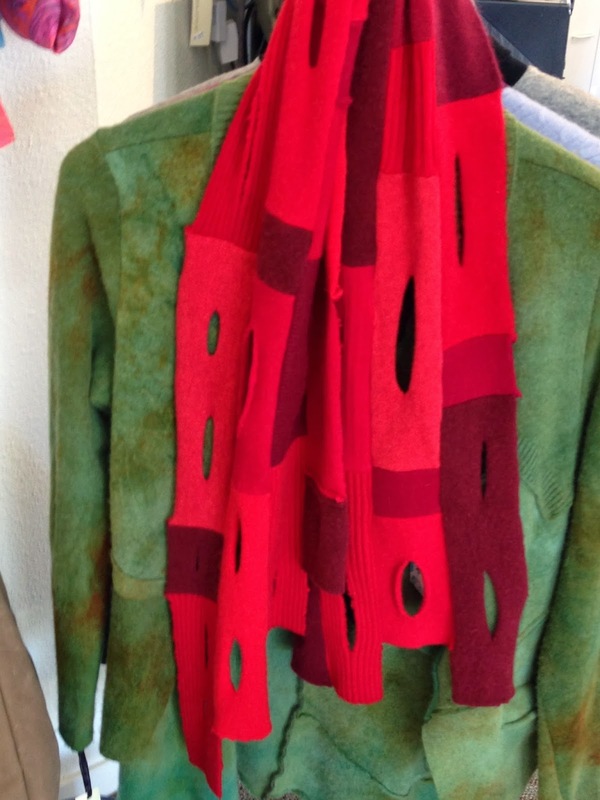 Another scarf that didn't get shot in studio. 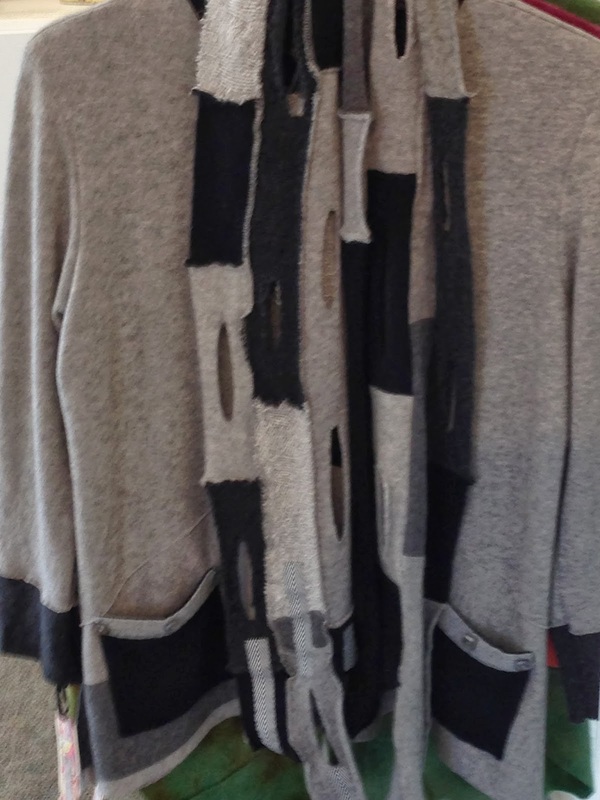 There's nothing like cashmere around your neck on a cold day! I've been compelled to work on only small items lately. 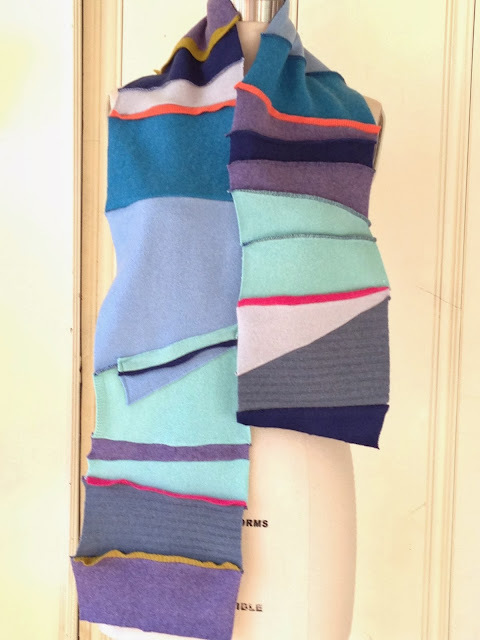 I keep dreaming of making garments but a combination of chilly weather, holiday buying and I don't know what has driven me to make one little bitty thing after another. All are off to Many Hands for holiday presents, I'm sure. 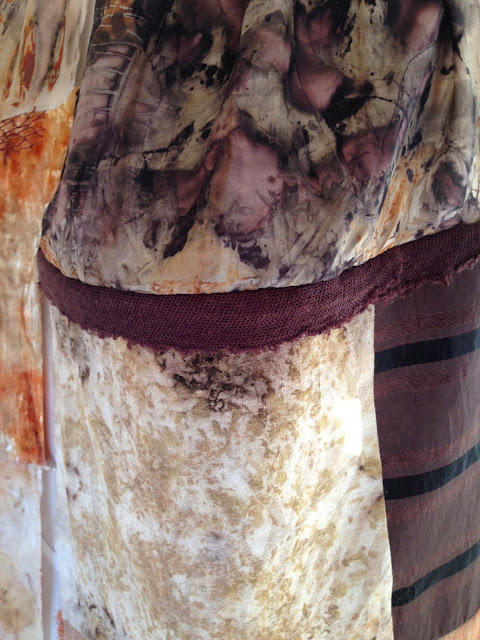 I took a fun eco dye class from Lorri Scott several months ago. I came home with a collection of silk hankies, one velvet piece and a cotton jacquard tablecloth scrap, all dyed with various flowers, leaves and rusted bits. I've been wanting to make them into something but couldn't figure out how to make all the disparate pieces come together. So, I went into my stash and found some bits and scraps that I've collected and been given. It all came together nicely. Looks rather Japanese in a way, I think. 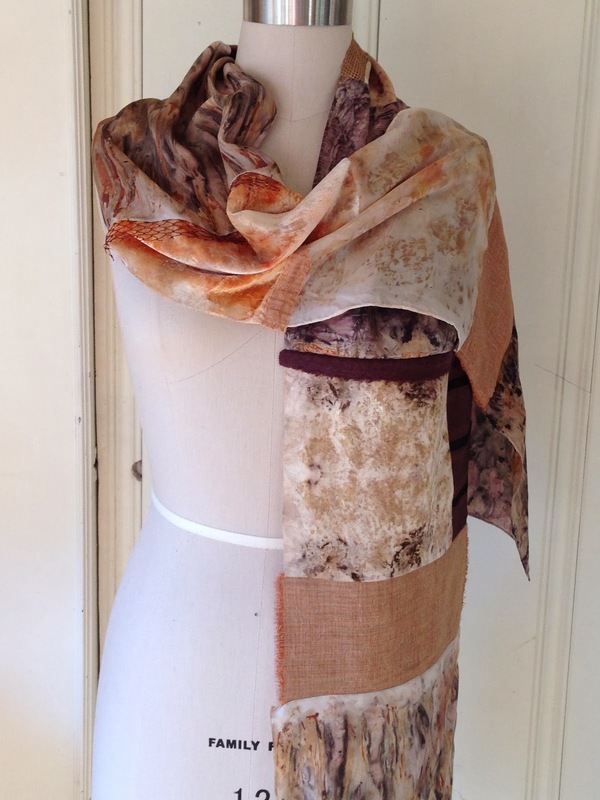 It drapes really nicely and because of the silk we be warm despite being lightweight. 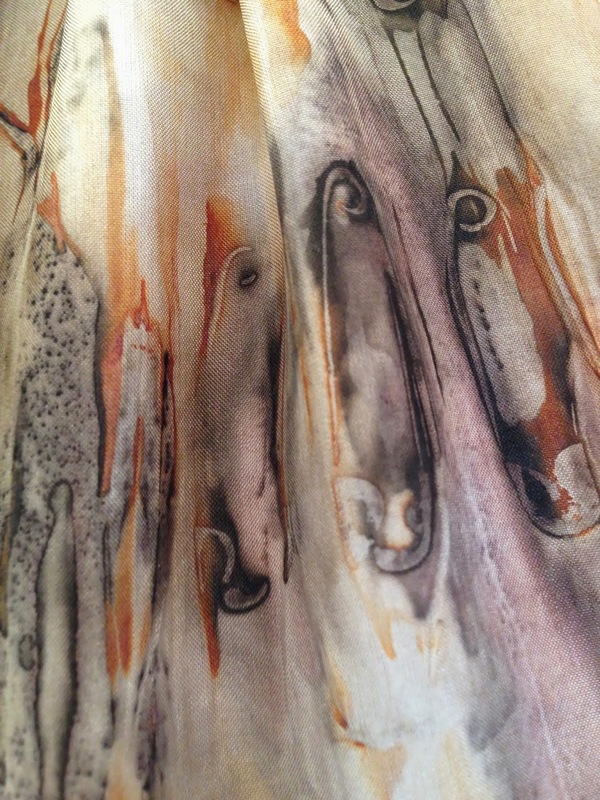 This view has a piece of silk on top, dyed with who knows what, I didn't keep track…sorry. The middle strip is a sliver of silk knit a friend gave me. The bottom is the tablecloth. The jacquard gave it a nice texture. 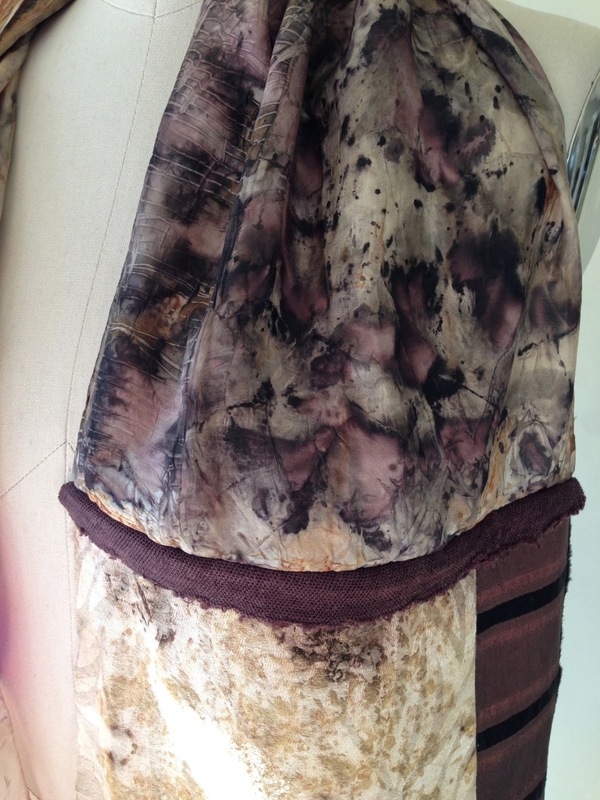 On the right side you will see a length of Talbot tie fabric. 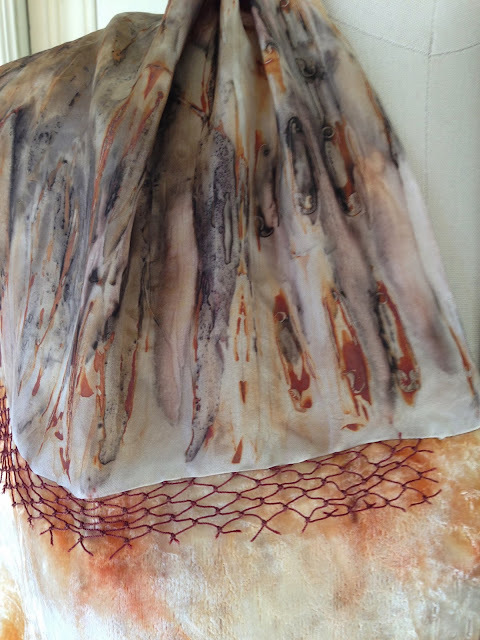 This silk piece was dyed with eucalyptus leaves and safety pins. Love the colors and shapes. The netting is from a large piece I got in Morocco. It's cut from a hamam scrubbing cloth. I have several of these I bought in a Taroudant bazar. They're in various shades of burnt sienna, burgundy and melon…love them! The lower piece is the silk. 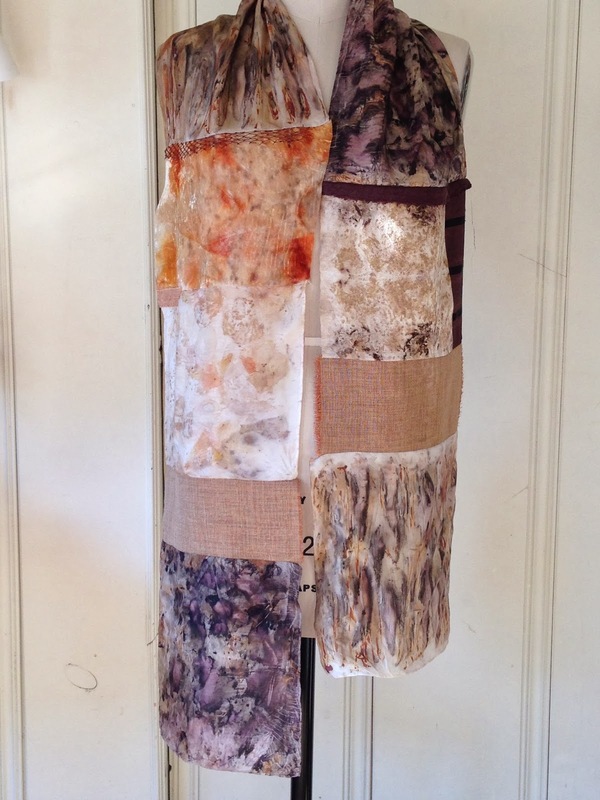 Takes the colors so well but is such a bear to sew. Close up of the safety pins. Another close up. I think the plum color was…oh I give up, I can't remember! Using my cashmere again. I never tire of working with it. And there are so many great colors available in second hand stores. I'm trying different color mixes using various contrasting strips for accent. 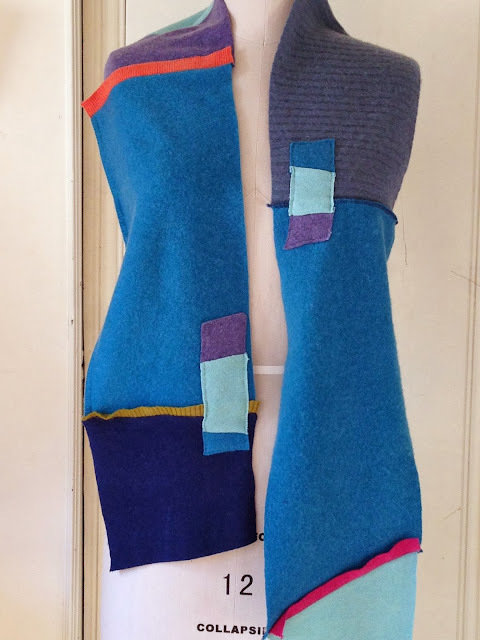 Been using both my serger and sewing machine. I like both looks. These are satisfying to work on because each one is a little painting. A beret using a pattern that has a larger profile than I've used in the past. 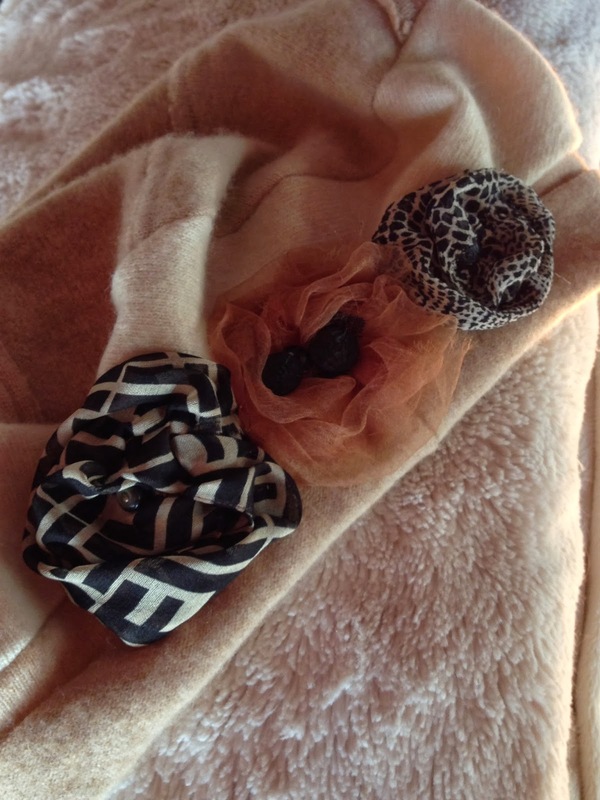 I still love using vintage scarves and buttons for embellishment. OK, here's a confession. I just bought the new Baby Lock Serger with the big floor. Oh boy. It's wonderful. It won't replace my old Baby Lock Evolve, I love that little guy. 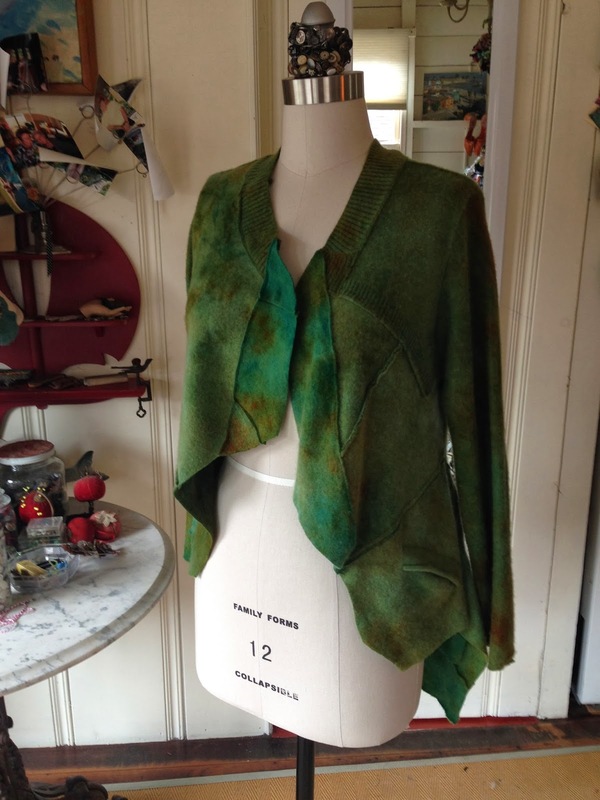 But this one allows me to sew larger pieces together using the cover stitch. Here I used it for the top of the hat. Sorry, these pics aren't so great, you can't see the detail in the patched top and the vintage black buttons in the center of the "poufs"
More to come soon, I'm on a roll!